I've set a new goal: For the next year, when shopping for clothing or accessories in Rome, I'm only buying handmade or preworn. And I'll be sharing what I discover with you. That means that, over the next few months, I'm going to be writing about artisanal stores around Rome—including what streets to hit up for Rome's best (unique, great-value, and no-chain) shopping, and blog posts on some of my favorite artisans. If this sounds niche, or like a topic only for those of us who live in Rome, I don't mean it to be. 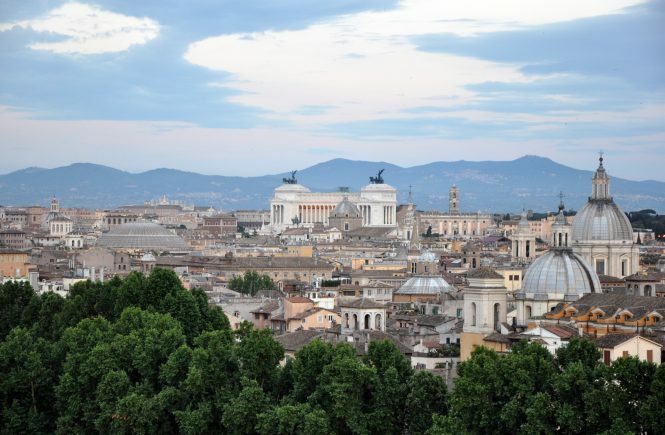 Travelers to Rome often ask me what they should buy as a souvenir or gift; I can't think of a more priceless memento than, say, a handmade leather passport holder, or a handcrafted ring reminiscent of ancient Rome. Even if it costs more than a made-in-China "Rome, Italy" T-shirt, it'll last longer, feel more special, and bring you into contact with a Roman artisan, perhaps even letting you see how it was made. (Plus, these handcrafted goods aren't always pricier than the factory-made stuff. But more on that later). Still curious why I've made the decision to avoid chain store shopping in Rome? 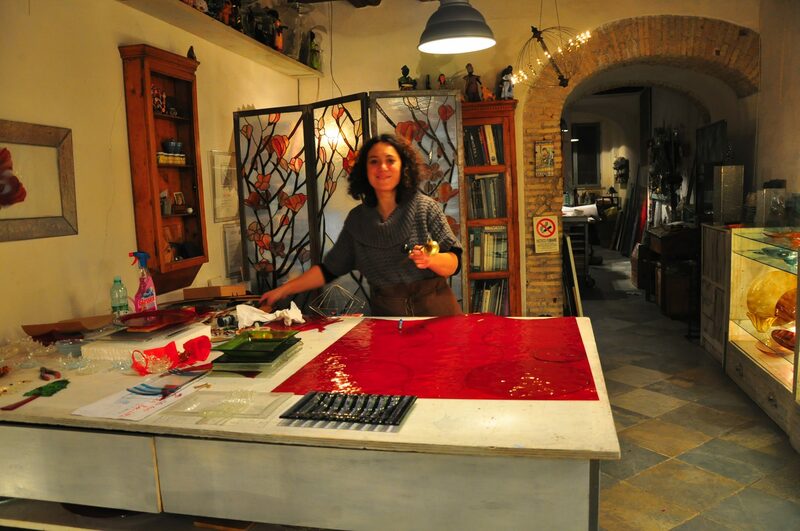 One of my favorite things about Rome is its artisans (above: Anna Preziosi at Silice, an artisanal glassmaker). I love seeing sewing machines in clothing shops. I love that there are still picture-frame makers and basket weavers here. It adds a sense of diversity within, and uniqueness to, Rome that simply wouldn't exist if H&M and Zara replaced every atelier and Pier One took over every picture-frame shop. It makes walking around—and shopping—fun. 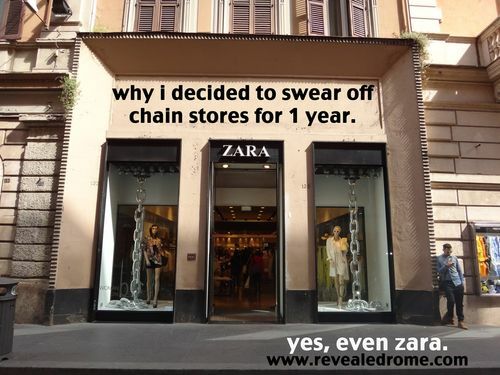 So, in general, I've tried to avoid chain stores in Rome. Except for one: Zara. Open my closet, and you'll still see so many clothes from the Spanish label's line, I could practically open my own branch. (Not that Rome needs another one—there are three on Via del Corso alone!). 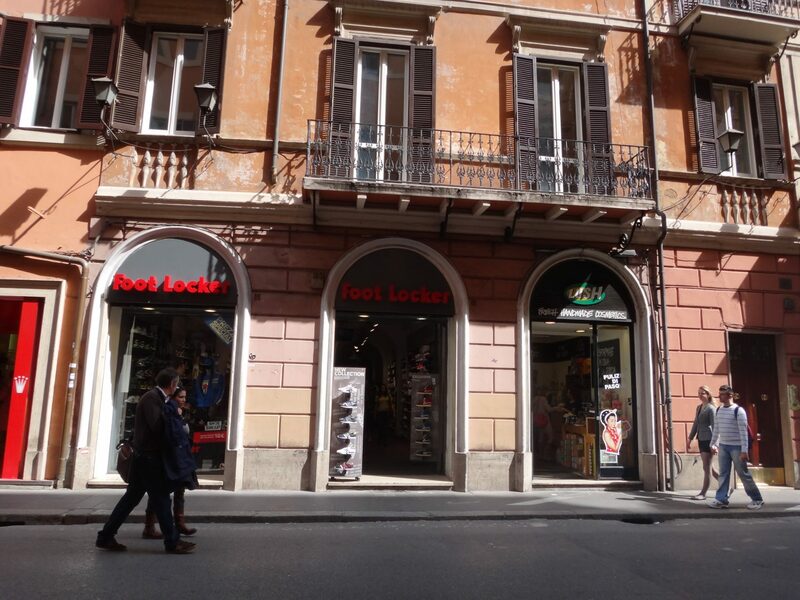 When their Italian flagship opened on Via del Corso, I was thrilled. And then, this winter, I stopped by—an all-too-frequent habit—and, as I browsed, accidentally knocked down a hanger from a pole overstuffed with clothing. I picked it up and, rather than replace it and recreate the problem for someone else, set it on a table. One of the shop workers beelined over. "Oh," he said in Italian, "so you knock things down for me to pick up, do you? Is that how it goes?" I looked at him, speechless. "Right," he continued. "Yep, I see. I just clean up after you. Oh, that's great! That's really great! Thanks so much!". That's when I realized. My addiction to chain-shopping? It wasn't just bad for my wallet. It was bad for my emotional health. I was giving my complete loyalty to… a corporation that didn't care less. If I wouldn't do that in a relationship, why would I do it with my hard-earned money? Of course, a quick Google search can show that many of these big, beloved brands don't only not care about you (they have so many other millions of shoppers! )—they also don't care about the people they employ. Zara recently was penalized for the terrible conditions of one of its factories in Brazil. It's no secret that Forever 21 is one shady business, running sweatshops both at home and overseas, and, by blatantly ripping off designers and artists, breaking so many copyright laws it's faced more than 50 copyright lawsuits… all while proselytizing Christianity to its employees and printing Bible verses on their shopping bags! Even Urban Outfitters—which, from their clothing's urban trendiness, you'd think would be all about planet-saving hipster ideals—has no labor guidelines; the International Labor Rights Forum accuses the store of using child labor in Uzbekistan. Big-theme issues aside, there's another good reason to get away from factory-made goods: the quality. I don't just mean for the cheapie stores, like H&M. I mean for the upmarket stores, too. I recently purchased an expensive bag from Baldinini, an upscale Italian store, that promptly lost its dye. The store sent it back to the factory to be repaired; it was returned to me and the same thing happened again. When they let me trade that bag for another, within a month, the strap of the new bag had started tearing off. They repaired the bag again. And three months later? The outside pocket started ripping right off the bag. Turns out, when you're paying €300 for a bag, you're still paying for assembly-line production and factory-level quality. Just more for it. Of course, I know the whole issue is complicated. I know that all of these issues have to do with globalization, and the modern economy, and outsourcing, as well as the particular decisions made by these particular brands. And I don't mean to romanticize an artisan-filled past: Obviously, factories and machines have made life much easier and cheaper for everyone First-World consumers. But, just as I think we lack a crucial understanding and awareness of what we're eating when we consume food that's traveled thousands of miles from its origins, been repackaged, marketed, and sold out of season… so do we all lose something when we only buy products delivered far away from their source of creation. We lose the awareness that, for the product to be so cheap, very cheap labor was involved. We lose knowing how many hands it passed through to get to us (and how many of those people touching it were involved with the black market and the Mafia—just read Saviano's Gomorra if you're curious). We lose a sense of responsibility for how it was manufactured, why, and what it took to get it to us (i.e. thousands of miles of petroleum-heavy shipping and trucking). What do you think? Those in Rome, have any artisans for me to try? And anyone want to join me on my year-long effort? Can You Guess Where, and What, These Little Bits of Roman Antiquity Are? Amanda, I really enjoyed this post and think you are absolutely right! The more people choose to buy cheap, chain-store, made-in-China clothes and objects, the more expensive the artisinal products will become which will just continue the cycle. So many people (me included) complain about the power and greed of the big corporations, thinking we can’t do anything about it, when in fact, this is one of the ONLY things that we actually (collectively) have the ability to change. Unfortunately the western thirst for quantity over quality means people will almost always spend their money on the many cheap things rather than on one expensive, lovingly crafted one. I am looking forward to hearing about your favorite independent shops and I am inspired to join your cause! I have a couple of shops to recommend but I need to check to make sure they are still in buisness (sigh! so often the fate of independent shops!) I’ll report back! Thanks so much for joining the “cause”! 🙂 It’s so good to hear that this resonates with you, and that’s a great point that this is a vicious cycle—the more we support chains over artisans, the pricier the artisans will be. Please do share your recommendations (when you find how they’re doing!) and any other suggestions you might have for shopping artisanal in Rome! I totally agree with your decision and I’d like to join you on your effort. I’m living in Rome since 3 years and I’m trying to know better this city through it’s artists and artisans. I’ll be on a trip in Turkey for the next month but will be back on April 28th for the big #salvaiciclisti bike protest in Rome. 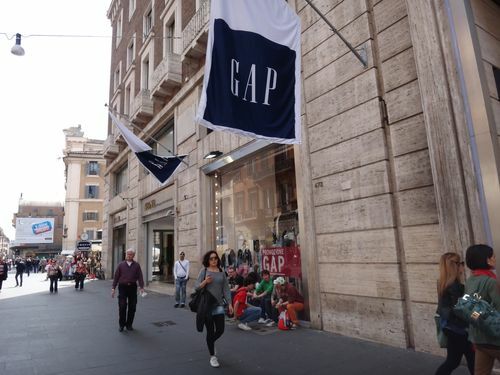 Then I’d love to meet and share our ideas about Rome’s alternative shopping possibilities! Thank you, Sezgi! So glad to hear this strikes a chord with you, and I’d love to meet. Shoot me an email when you get back from Turkey (and enjoy your trip!). I just found your blog while planning for my trip to Rome this coming October. I completely agree with all your reasons for shopping local and non-chain stores. I try and do that myself here in Canada. I can’t wait to hear about how it goes for you in Rome so I know what shops to visit! We are travelling to Rome tomorrow and I just discovered your blog today! What a shame, since your information is absolutely priceless!! Thanks a zillion for sharing such amazing information. I am spending the night reading up everything thats there. A quick question if you dont mind, with regards to the post above, is there any specific dresser you would recommend? I would just love to pay a visit if nothing! Completely agree on the chain store mania! Well definitely drop by after our visit! I’m so glad you’ve found my blog so helpful! Enjoy your trip to Rome—it’s a lovely time of year to go. As for specific dressers, I very much like Tina Sondergaard on Via del Boschetto, who does beautiful tailored work (I wrote about her in my post on shops on Via del Boschetto here https://www.revealedrome.com/2012/03/best-shopping-rome-via-del-boschetto-monti.html). On the same street, the young designers at Le Nou turn out handmade work that’s cheap and trendy. I hope that helps. Do let me know if you have any other questions, and safe travels!